This page is dedicated to the memory of Alexander Richard Thorburn, aka Alexander Richards, aka Arthur James Harris, who died on 9th April 1918 in France. Alexander Richard Thorburn was born on 7th August 1885 in Redfern, New South Wales, Australia, the son of Alexander Thorburn and his wife Adelaide May McGuffin. He died on 9 April 1918 in France, one of the many millions of men who lost their lives in World War 1. It seemed sad for him to have died and all but these bare facts remembered, so I've tried to find out at least a little about his life until his untimely death aged just 32. I need to start by saying that almost all the information repeated here is the result of the painstaking research of Alexander's grandson Jim Richards and that of Jenny and Marion. Jim has been kind enough to share Alexander's complicated life story with me and I have thoroughly enjoyed following as the mystery resolved itself. All the hard work in here is Jim, Jenny and Marion's; if there are any errors, they are almost certainly mine! Alexander's father Alexander Thorburn was born in Australia to Scottish parents who had emigrated at the start of the 1840s. His parents presumably emigrated in the hope of a better life. They were part of a large influx of Scots, with several brothers from the same Thorburn family who settled in New South Wales. Alexander Thorburn senior was the stationmaster at Byrock in New South Wales and had married Adelaide McGuffin in 1879. They had two daughters (Daisy and Flora) and Adelaide was pregnant with young Alexander when her husband was struck down by typhoid. Alexander Richard Thorburn was born about 6 months after his father's death. Adelaide was only 25 when her husband died and in 1890 she married again - to Arthur Swale Foster and had 4 more children. So Alexander Richard Thorburn was raised with his two older sisters and 4 half-siblings. The family lived in Berry and in Redfern, both New South Wales. As a young man Alexander Richard Thorburn worked as a dairy hand, but by about 1910 he was getting in a bit of trouble with the law for embezzlement and warrants were issued for his arrest. There seem to have been a few incidents, finishing with this one from November 1912. This is the last record found for him under the name Alexander Richard Thorburn - he disappears from official records after 1912. No death can be found under that name and no records of army enlistment or emigration. A few years after Alexander Richard Thorburn disappeared, an Alexander Richards pops up in the Melbourne area. 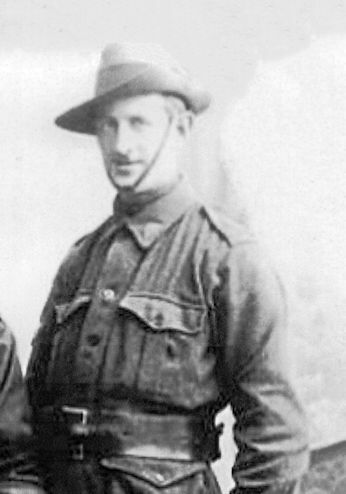 This Alexander Richards enlisted in the army in Melbourne in September 1914. Although the age given is a bit out, he lists Mrs A. 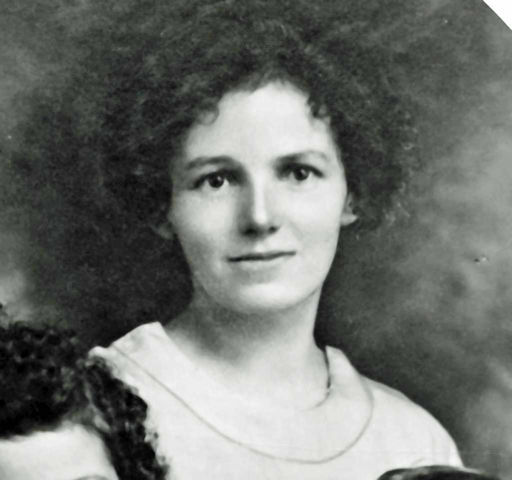 S Foster of 91 Buckingham Street, Redfern as his mother - this is Adelaide Foster formerly Adelaide Thorburn, the mother of Alexander Richard Thorburn. The descriptions of the two men are similar - both about 5 feet 9, both with red/auburn hair and with ruddy/florid complexions. The image below shows the first page of his attestation record. 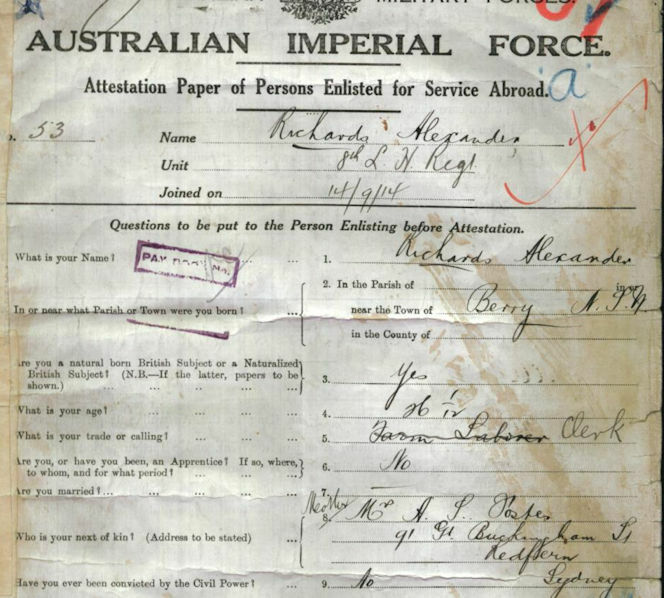 You can read the full army record for Alexander Richards here. There was no conscription in 1914, so Alexander must have joined of his own free will. But in February 1915 the army issued a warrant for him on the grounds of desertion; he left camp before the ship set sail. In September 1915 Alexander Richards had a child (Alexander Thomas Richards) with Mary Kate O'Connor in Melbourne. Perhaps it was the news that Mary Kate was pregnant that caused him to desert the army 7 months earlier. He did however do right by Mary Kate initially and married her in Melbourne in July 1916. The photo below is of Mary Kate Richards nee O'Connor. Mary Kate must have become pregnant again almost immediately as she gave birth to a second child in April 1917. For whatever reason, Alexander didn't stay for the birth of his second child. He enlisted in the army again in September 1916, this time under the name Arthur James Harris. He couldn't re-enlist as Alexander Richards as presumably there was still a warrant out for his desertion under that name. You can see his full service record under this name here. Arthur James Harris being one and the same as Alexander Richard Thorburn is indicated by his next of kin detailed as below - his sister Flora Sharpe and his mother Adelaide Foster. He is also described once again as having red hair. In December 1916 he embarked from Melbourne, arriving in England in February 1917. It seems likely that he never saw Australia or his family again. Poor Mary Kate was left to raise her children alone. She may never have found out what happened to her husband. In 1922 she filed a case for desertion of her and the children, presumably not realising that he was already dead. And it seems likely that his own family did not know of the existence of Mary Kate and the children, so were never able to help her. Initially he seems to have done quite well in the army and was promoted to Corporal, but this was not to last and he was demoted back down to Private. His battalion was sent to France in the summer of 1917 and in December he was wounded in action. His wounds couldn't have been too serious at this point as he rejoined his battalion a week later. He was granted leave to Paris in February 1918, but sadly when he returned to the fight, he was killed in action on 9th April 1918. 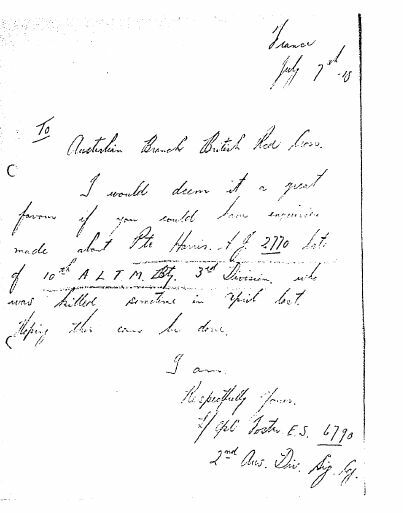 The Commonwealth War Graves Commission website revealed that Arthur (Alexander) was a Private in the 40th Battalion of the Australian Infantry, AIF and that his service number was 2770 and that he is commemorated at the Heilly Station Cemetery, at Mericourt-L'Abbe in Northern France. I can't reproduce the CWGC photo of the cemetery, but to see his page please click here. The Australian War Memorial website confirms much the same here. Following his death, there was much toing and froing between his family and the army administration over his war gratuity etc. His complicated life and use of different names couldn't have made it easy for his family. There is lots of documentation in the records here. His sister Flora was sent a list of his personal effects - a letter, photos, a pipe, YMCA wallet, cards, knife and playing cards. Sadly his belongings never made it back home as the ship they were sent on, Barunga, was sunk on its way home and everything was lost at sea. News of Alexander's death reached home by the end of April 1918 and both his mother and his brothers and sisters posted notices in the local newspaper (Sydney Morning Herald). In the files there is an account of Arthur's (Alexander's) death from a couple of soldiers who were there with him. One describes how Arthur was on guard duty at the doorway of their billet in the village at about 6am, when he was killed outright by a shell. What is nice is that this soldier described Arthur as "a very decent fellow and all thought well of him" and another described him as "very jolly when off duty". Alexander was buried in Heilly Station Cemetery in Northern France. I don't know if he is commemorated back home anywhere; it would perhaps have been difficult given his different surnames. So far I know of only one confirmed photo of Alexander/Arthur. 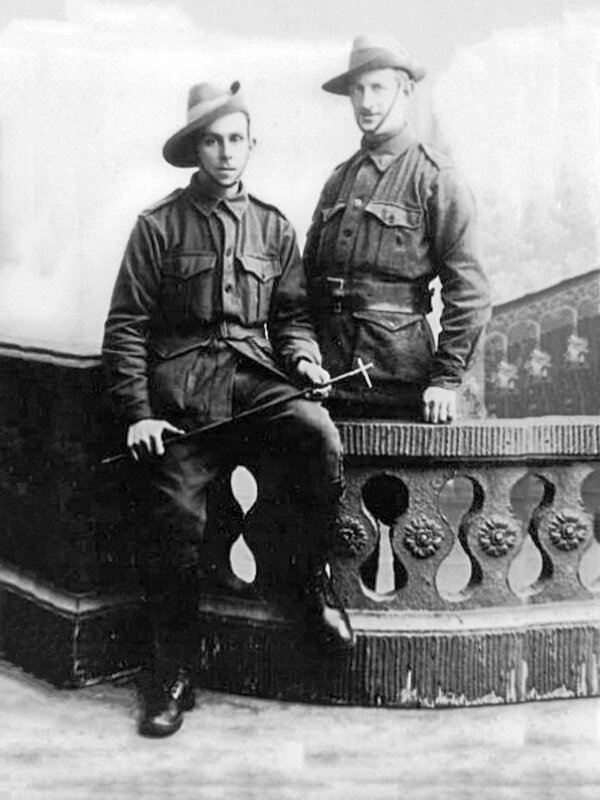 The photo below shows Alexander Thorburn/Arthur Harris standing with his half brother Arthur Foster sitting. It was sent as a postcard to their aunt Bessie in South Africa, from France in April 1917. The back of the postcard reads: "I hope you are all well, I would like to see you all. Things are getting very lively here and Fritz is getting a hot time just now. We are all in this big push up to our necks. Rich has gone over to hospital with trench feet and Arthur Mac slightly wounded Eric (Foster) alright so far and Arthur (Foster). This is he and I taken in England. Will write a letter next week. Am going to try to call at South Africa going back if I get a chance. Love to all Alex." The evidence that Alexander Richard Thorburn, Alexander Richards and Arthur James Harris are all one and the same is pretty compelling. The consistent use of his sister Flora and mother Adelaide as next of kin, the red hair and other similarities in physical description. The fact that there is no death for Alexander Richard Thorburn and no births for Alexander Richards or Arthur James Harris that would fit the facts. But to prove it all, Alexander Richards grandson Jim has gone a step further and proved the connection with DNA tests. They really all are the same man. Although Alexander had a troubled start in life and was perhaps a bit of a rogue, there was clearly a lot more to him than that. By all accounts he was a likeable guy and Mary Kate must have fallen for him. He did do right by her at least by marrying her and had he survived the war he may well have returned to her. And of course he did enlist (twice) and ultimately fought and died for his country. So like all the other soldiers who died in WW1, he deserves to be remembered with respect. In researching Alexander's final days, several sites have been invaluable, so I've included links to some of them here. The National Library of Australia is a fantastic online resource for, amongst other things, digitised newspapers and images.